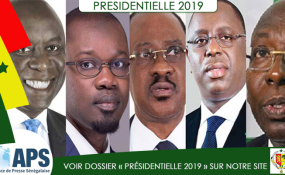 The five candidates contesting for president in Senegal. Eight journalists have been wounded, with three of them in critical condition, following an attack on the press corps covering the political campaign of opposition presidential candidate Issa Sall. The journalists, who were in a bus, came under attack on February 11, 2019, when supporters of the two candidates clashed in the city of Tambacouda, some 420 kilometres east of the capital, Dakar. Supporters of Benno Bokk Yaakar (BBY), the president's party and Issa Sall's Parti de l'Unite et le Rassemblement (PUR) clashed as the two candidates arrived in Tambacounda, a BBY stronghold, for political rallies. At least two people from the BBY party were killed in the clashes. The journalists who were following Issa Sall's convoy were attacked by the president's supporters in the heat of the clashes. According to the correspondent of the MFWA in Senegal, some of the assailants mistook the reporters for PUR supporters, while others knew they were journalists but still targeted them for being in the convoy of the rival candidate. Eight of the journalists suffered various degrees of injury, three of whom are in critical condition at the regional hospital in Tambacounda. The Union of Information and Communication Professionals of Senegal (Synpics) have condemned the incident calling it a "targeted attack" on journalists. They have also demanded that buses for the press corps which follows the convoys of candidates and parties should be branded with the inscription "press" rather than in party colours. The MFWA condemns the deadly political violence and the vicious attack on journalists by the political party supporters. We urge the various political parties to educate their supporters to appreciate the important role of the media in the electoral process and the need to protect journalists. The MFWA calls for a thorough investigation into the violence at Tambacounda and the prosecution of the perpetrators.